After making start.me faster than ever, we’ve been working really hard to make it more useful to everyone. Our brand new search widget will do the trick. In this article, we explain the basic features but also the advanced personalization options. It will really save you time! We also introduce a minor improvement, you’ll love all the same! Everyone loves Google, obviously. Their market share has reached over 90 percent and it continues to remain strong. That’s why we’ve integrated the Google search bar in our startpage. Google Custom Search is a much-appreciated part of our Start Page. 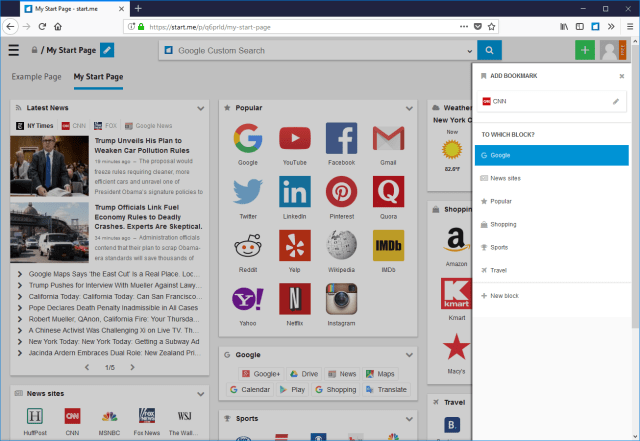 You can use it just like you would use the Google Omnibox and it comes with benefits, like searching your bookmarks or quickly adding bookmarks. You can also personalize it further, by setting a Custom Search Engine. There are many reasons you might want to do this. Privacy online, for one thing. Google tracks you around and records every search term you’ve entered. But what if you preferred to keep some searches hidden? Just install more privacy-minded search engines, like startpage.com or duckduckgo.com. With one simple click, you could switch from an open search to a private one. The Add Search widget pane. 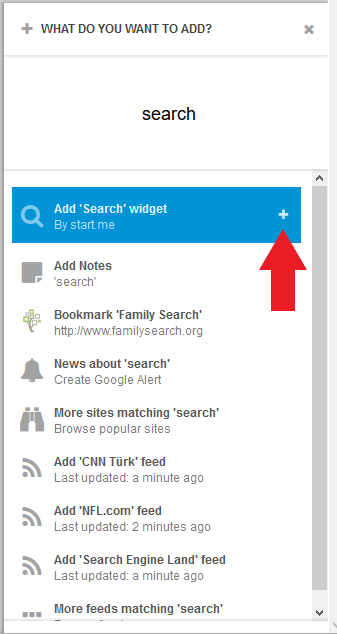 The Search widget makes it easier than ever to make your searches safe and fast. An option will appear. “Add ‘Search’ widget”. Click the plus to accept. Now you can add a custom search engine. Type in the name of the search engine you’d like to add and the correspondent URL. We’ve entered the name of our partner Startpage.com. 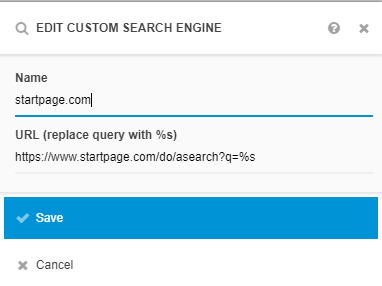 The search URL is this one: https://www.startpage.com/do/asearch?q=%s. The final bit, %s, is where the keyword will be pasted. It should be added to the URL. That’s it! Now you’ve got a Search widget dedicated to a privacy-oriented search engine. You’re free to enter as many alternative search engines to your Search widgets as you’d like. Switching will still be as easy as clicking a button. The really cool and time-saving feature of this widget is the URL you can enter yourself. Once you realize you just have to substitute keyword with %s, you’re entering a whole new world of searching. The reason is simple: every site has a search option. And every time you search for something, the result will be a URL you can scan for the keyword. Once you’ve found your keyword, it’s as simple as Copy – Paste. Remember to substitute the keyword for %s, and that’s it. Search your books directly on Amazon, your poets on Wikipedia, your pictures of beaches on Flickr or Unsplash. You can even save the conditions or licenses you prefer. Searching has never been more personalized. Click the little arrow in your Search widget, select Manage search engines and Add custom search engine. The final improvement we love to announce here is the way we present your bookmark blocks. Some users, and we’re one of them, have collected so many bookmarks, subdivided in many different bookmark blocks. To make navigation easier, we now present your bookmark blocks in alphabetical order. To which block? Sorting should be logical! We consider it a minor tweak, but it’s still useful, don’t you think? Please let us know what you think of our new Search widget and the new sorting option. We’d love to hear from you!